Smoked salmon fillets, 1 per person. 1 bag of watercress, washed. Lightly grease a large piece of aluminium foil, (dull side). Place salmon fillets on it, dot with butter, and fold foil into a parcel, tightly sealing edges and allowing a little space inside for air to circulate. Place in a preheated oven at 200°C and bake for 20 minutes. Meanwhile, prepare salad. 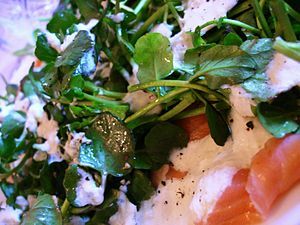 Divide watercress between two dinner plates/shallow bowls. Slice tomatoes and beetroot and place on top. Make the dressing by mixing together half a small pot of créme fraîche with 2-3 teaspoons of horseradish sauce, (or to taste). When the salmon is done, place on top of the salad and spoon as much of the dressing over as you would like. Enjoy! This would be lovely with a bottle of chilled white wine.